Can you believe that the first marking period is already over? We still have so much learning to do! I have many exciting activities planned to make learning fun this school year. Remember to always be responsible and respectful to your new friends. Would you like to know some fun facts about me? Well, I love to shop for decorations for my home and I love eating ice cream. I also love to shop for new clothes. I can't wait to get to know each one of you a little better. Let's make this a great marking period! Check out the Room 24 Monthly Updates page to read about what we'll be learning this month. Congratulations on being a terrific 3rd grader! 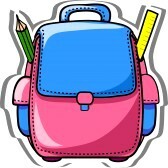 Remember to refill your school supplies as you need to.